As the donor class continues to push for a Rep. Paul Ryan (R-WI) Speakership, conservative activists have renewed their scrutiny of Ryan’s support for a radical Republican policy of open borders. Breitbart News has discovered yet another little-noticed video in which Ryan articulates his commitment to immigration policies that would dissolve America’s sovereignty. 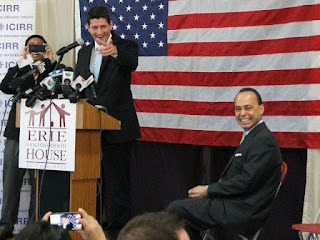 The video, uploaded by the Journal Times, shows Ryan at a July 2013 bilingual Hispanic Listening Session in Racine, Wisconsin. At the meeting, Paul Ryan told a predominantly Hispanic audience that the job of a U.S. lawmaker is to put oneself in the shoes of foreign nationals who want to come to the United States, then work to discover solutions to make their lives better. The Journal Times notes that the purpose of the meeting was for Ryan to “explai[n] to them his motives” for pushing to enact Sen. Marco Rubio (R-FL)’s amnesty and mass immigration agenda in the House of Representatives. This is the American Dream. This is the American idea. Look, put yourself in another person’s shoes, which if you’re in elected office, that’s what you kind of have to do that almost every single day. The job we have–and what we do is we take different people’s perspectives. The gentleman from India who’s waiting for his green card. The DREAMer who is waiting. We take all these different perspectives. We process it through our values and our morals and our principles. And then we come up with the answer to try and solve this problem. That’s basically what we do in our jobs. Ryan’s statement may strike some listeners as bizarre—many may think that the job of U.S. Congressman ought to be to put himself in the shoes of his citizen constituents who elected him, giving their needs greater priority than the desires of someone from a foreign country. Ryan’s message, however, of prioritizing the needs and desire of foreign nationals who do not reside in the United States, is in line with the thought process of those who support the principles of open borders—i.e., a policy of allowing foreign goods and labor to freely and legally cross into and out of the country without interference. Similarly, Congressman Rep. Mick Mulvaney (R-SC) has argued that it’s too difficult to give foreign citizens access to American jobs, American schools, and U.S. ballots. “The simple truth is our immigration system is broken… it’s too difficult to enter America the right way,” Mulvaney states on his website. However, the Ryan-Rubio-Mulvaney argument that the United States is difficult to enter simply is not true. In fact, the United States has the most generous immigration policy in the world. Because of its vast admissions policy, America has four times more immigrants living here than has any other country on the planet. As a result of our current federal policy of autopilot visas dispensations, each and every day the United States admits enough net immigrants to fill an overcrowded, metropolitan high school. Every week, the United States imports enough immigrants to fill the Staples Center, where the Los Angeles Lakers play. Every month, we resettle a number of immigrants that is nearly the size of the population of East Los Angeles. Every year, we receive a population the size of Dallas. Every three years, we add another entire city of Los Angeles made up of foreign-born immigrants. In just Muslim immigration alone, the U.S. gives more visas to Muslim migrants each year than there are Mulvaney voters in his district of South Carolina. According to Pew Research, only 11 percent of Muslim Americans identify as Republican or leaning-Republican, making them one of the most reliable Democrat voting blocs in the country. I love America. I believe I’m an elected official. And who puts me in office? […] The people who should benefit from my actions are the American people. That’s who should be first. Some people seem to think they represent groups, they seem to think we represent the whole world, they think we represent business groups, and activist groups and La Raza or the Chamber of Commerce, and we’re losing sight of who we represent. And it’s absolutely clear that too large a flow of [foreign] workers, particularly lower skilled workers, hammer American workers, damage their ability to get a pay raise or even get a job. That’s not disputable. That matter has been settled. And someone needs to be worried about those people… I think that’s been lost sight of in your nation’s capital. Paul Ryan, however, over the clear objections of the American people—and, in particular, Republican voters—believes that we need to increase our record high intake of foreign citizens. Putting myself in his shoes, I don’t think I would have done anything differently. If I was living in a country where I had no opportunity, where I was living in despair and poverty and I was fearing for my safety and my family’s well-being, I would go anywhere to make a better life for myself and my family. Who wouldn’t do that? What’s great about this country is we have been this sort of beacon of hope for families, for people. My family is no different than anybody else’s. My story is no different, just couple generations removed. The point of America is this melting pot. This beacon on the hill, where people come in search of a better life for themselves and make a better for themselves and contribute. That ends up producing a very dynamic economy, a very dynamic society. Unfortunately, Ryan’s bromides are not supported by facts. During the middle of 20th century, when the United States had enacted strict immigration curbs, the nation saw rising wages, an expansion of the middle class, and assimilation of immigrants already in the nation. In 1965, however, a Ted Kennedy-led immigration rewrite eliminated the immigration caps that had been enacted by President Coolidge and opened up American immigration visas to almost anyone in the world. Today, after four decades of rampant visa dispensations, reports document sustained compression to our nation’s middle class; real average hourly wages are lower today than they were in 1973; all net job creation among working-age people went to foreign workers from 2000-2014; the number of struggling Americans forced to rely on welfare has reached a record high; overcrowded schools, which are now majority-minority, have struggled to accommodate the growing number of students that qualify for reduced lunch programs and require English language instruction; an influx of a diverse student body with fewer English speakers has sent U.S. test scores plummeting; and the importation of criminal organizations has negatively impacted the safety of what are now gang-besieged communities. The influx has proven especially deleterious to black Americans and immigrants already in the nation, who have struggled to lift themselves into the middle class as they find their job opportunities and wages driven down by a federally-sponsored flood of additional foreign workers imported into the country. The unlimited supply of workers, however, has benefited many of the business interests who donate to Mr. Ryan and Mr. Rubio’s campaign war chests. Large-scale immigration pads the labor market and thus the bottom lines of employers who can offer lower wages. Immigration, however, is not America. The country was originally a British Colony and was founded by men like Thomas Jefferson, James Madison, and John Adams. These men were not random migrants from across the globe but colonists carrying on a intellectual legacy from forebears stretching back to the Magna Carta and earlier yet still to the Roman Senate and Greek philosophers. Under current immigration policy, every year the U.S. lets in five times more immigrants than the number of soldiers who served under the command of George Washington in the Revolutionary War. Sure Paul Ryan can be House Speaker--when there's a Democratic majority. His Republican bid should be dead in the water, a complete non-starter. It's said that Ryan is making a list of conditions that everyone must accept so he can grace the Republicans with his leadership and his presence. This is a younger John Boehner II. He should be out with the original. Our immigration system is broken. It used to be that a legally admitted alien could be deported for being a public charge, ie. receiving food stamps, subsidized housing, welfare, SSI. No more and over 67% receive some form of welfare. We use the HI visa not to get need, essential workers but to get cheap workers and reduce wages. We have zero means of tracking people who enter the USA on tourist visas. Worse we give visas to children that are good forever, not just as long as their passport endures but forever. And who can tell what a one year old will be at 21? As for Ryan and Rubio, they are typical of the elites who govern. Corrupt, perverted, and isolated from real Americans in their persuit of personal wealth and fortune. I've seen more integrity in 3rd world hell holes than we have in the congress. "Today, after four decades of rampant visa dispensations, reports document sustained compression to our nation’s middle class; real average hourly wages are lower today than they were in 1973; all net job creation among working-age people went to foreign workers from 2000-2014; "
I wander in here after reading this quote and more of it on another forum. It finally totally hit me. I have been watching this happen since 1973, watching the US Middle -class get crushed. New that my grand-parents and before and my baby boomer parents had it easy . By the 1980's it was getting tougher and tougher. Yes , the enemies of "America" exist, and they aren't "terrorists" in some foreign land , but our government here and the forces that control it. Trump was elected because people are realizing something is up. They don't quite realize the real enemy and that enemy is of course the enemy that cannot be named. Notice that "political correctness" grew during this same time too, although there have been hints of it for a long time, But PC allowed a "shield" to cover the massive immigration and more important in provided a shield where the enemy who cannot be named could operate with impunity. Thank y'all for putting it down in such short and damning terms .